Valentine’s Day is coming up fast, and we all know what that means—romantic meetings and sweet treats galore! 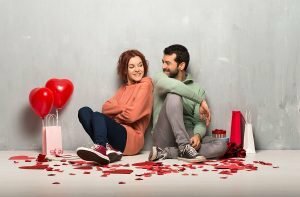 many Valentine’s Day events involve sweet treats or alcoholic drinks that are not dental-friendly, and many others include getting close with those you care about. At Mayfield Dental Care, we want our patients to look and feel healthy, both for themselves and for their loved ones. To help you have a great Valentine’s Day, we hope the following tips will help you make dentist-approved choices on Valentine’s Day! Whitening. Valentine’s Day calls for kissable lips and white teeth. If your teeth have become dingy or stained, Mayfield Dental Care can help. Zoom! Whitening is a teeth whitening procedure that delivers whiter results in less than one hour. The procedure uses the Zoom advanced power chairside lamp, which accelerates the bleaching process. With Zoom! Whitening, the shade of your teeth can improve up to eight times. The bleaching gel removes persistent stains that resist regular whitening, and the resulting improvement is proven to last longer. The perfect smile is freshly cleaned. Special days call for extraordinary efforts – and Valentine’s Day is just that special. You’ve probably chosen the ideal outfit for a night on the town, but what about your smile? Make your smile dazzle by scheduling a dental checkup a few days before a romantic evening. A tartar free smile, all polished and clean, begs your honey to snuggle closer. As a bonus, a good cleaning can also freshen your breath; perfect for romantic evenings. If you have big plans for Valentine’s Day, call Mayfield Dental Care today, to schedule an appointment for scale and clean. At Mayfield Dental Care we provide comprehensive dental scale and clean along with different preventive dentistry services for better oral health. Be careful with sweets. Valentine’s Day can be a landmine of sugar with candy, chocolate, wine, desserts, and all manner of foods that are stuffed with sugar. But sugar is the enemy of your teeth. Every time bacteria contacts sugar in your mouth; the result is acid that attacks teeth for 20 minutes or more. Cavities are caused by tooth decay that destroys the tooth structures and can affect both the enamel and inner layer of the tooth. This may not affect you this Valentine’s Day, but in Valentine’s Days to come, you do want to have all your teeth, right? Make sure your breath is great. Make sure to brush and floss regularly, and if you go out to dinner on Valentine’s Day remember a few things to help your breath stay kissably sweet. Brush your teeth (and tongue!). Floss before your date to remove food that might be stuck between teeth. Use mouthwash to kill existing germs. Avoid smelly foods like onions and garlic. If you left your mints at home, gnaw on garnish – believe it or not, it neutralises smell-causing sulfides. Bring a flosser or toothbrush, head to the restroom and ensure there’s nothing between your teeth. Then rinse with water. Chew gum with xylitol after eating and drinking. Relationships require regular check-ins. These Valentine’s Day tips are not all you should do to protect your teeth. Professional dental care is essential, so contact the friendly staff at Mayfield Dental Care to ensure the health of your teeth. We offer a wide array of services including professional teeth cleaning, dental health education, and restorative and cosmetic procedures. Show your teeth some love this Valentine’s Day by scheduling an appointment with Mayfield Dental Care. Our guiding principles are innovation, culture, and care. Our equipment is cutting-edge, and our outlook is forward-looking to provide you with the best dental experience you have ever had. Call us at (02) 4023 3885 or visit us at 181 Maitland Rd in Mayfield.